Welcome to Roadmap Update #3. First things first. Happy New Year and Meeerry Christmas everyone. 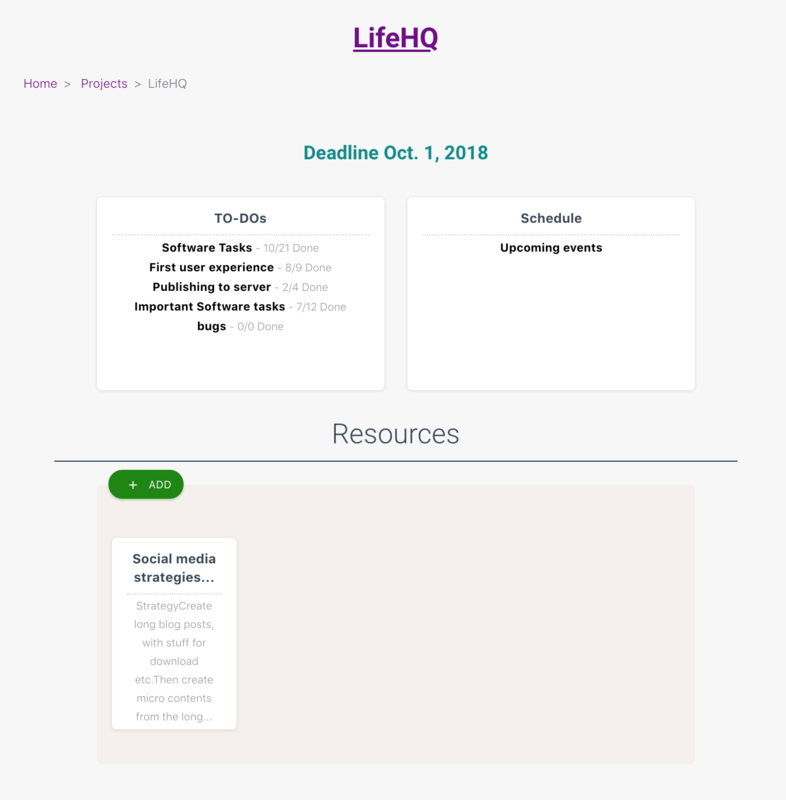 Thank you for reading and using LifeHQ and thank you for the incredible feedback about your experience. Let’s make 2019 a year to remember, a year of accomplishment, transformation, courage and adventure. Today I am so excited to announce my favorite LifeHQ feature to date, the Advanced Pomodoro module. I have been using the Pomodoro technique for a few years already and I recently wrote about my best practices. This is a must-have for any productivity enthusiast and it is something I planned on developing from the beginning at LifeHQ. 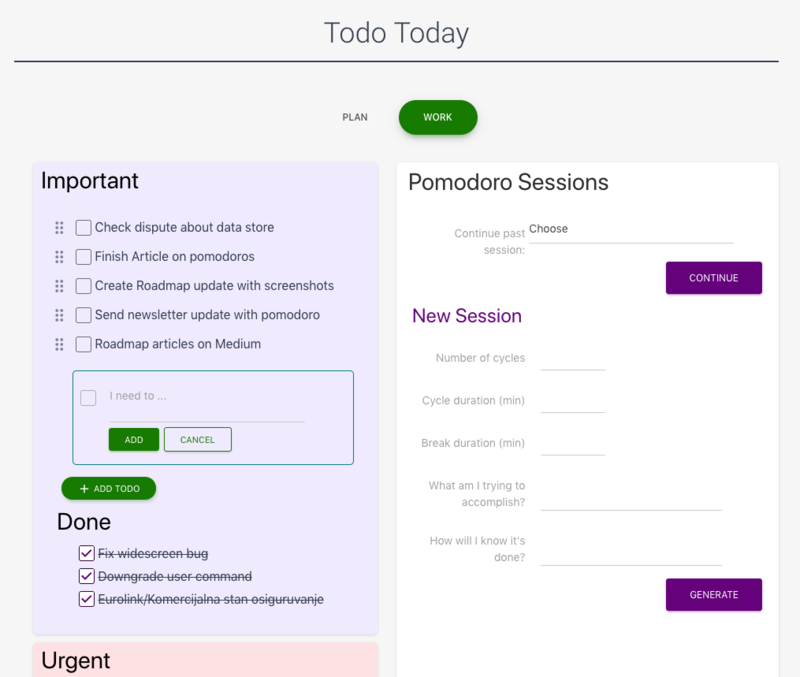 The Pomodoro module is located in the Daily Todo section under the work tab. 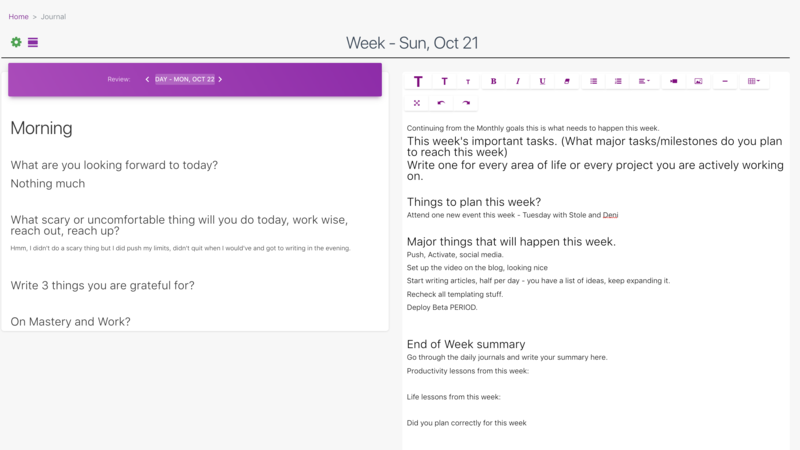 The idea is to plan your tasks for the day in the Plan tab, choosing from every project that you need to work on. 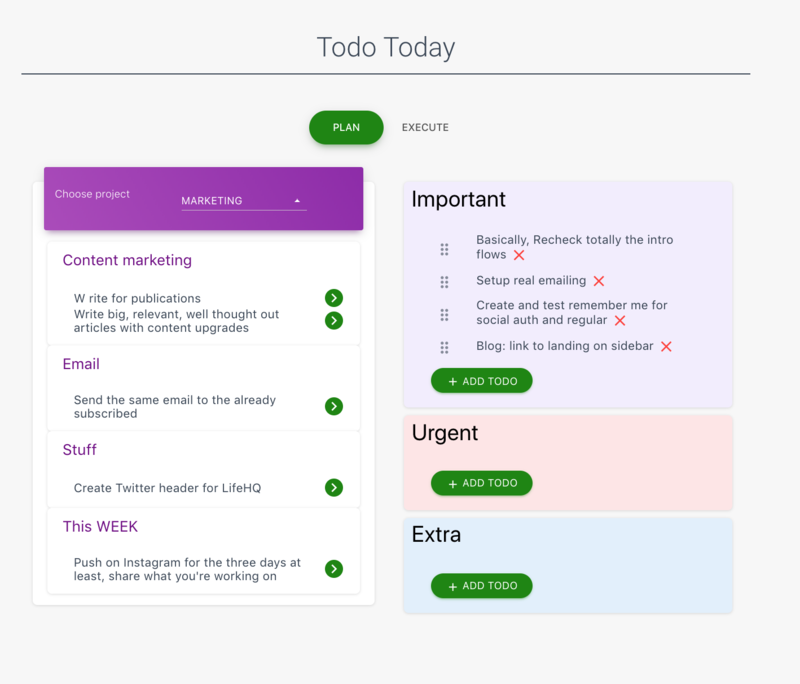 Then when it’s time to work, you move to the Work tab, decide what tasks are going to be worked on in your pomodoro sessions and start crushing them. Every Pomodoro session should be customized for the tasks you are going to be working on. In time you will develop the intuition for how much you can accomplish in a period. When creating new session, the first 3 parameters are required: Number of cycles, Cycle (work) duration and Break duration. The remaining two questions are optional but useful for thinking through what you want to accomplish before starting. Once you generate new Pomodoro session, you will see the screen above. 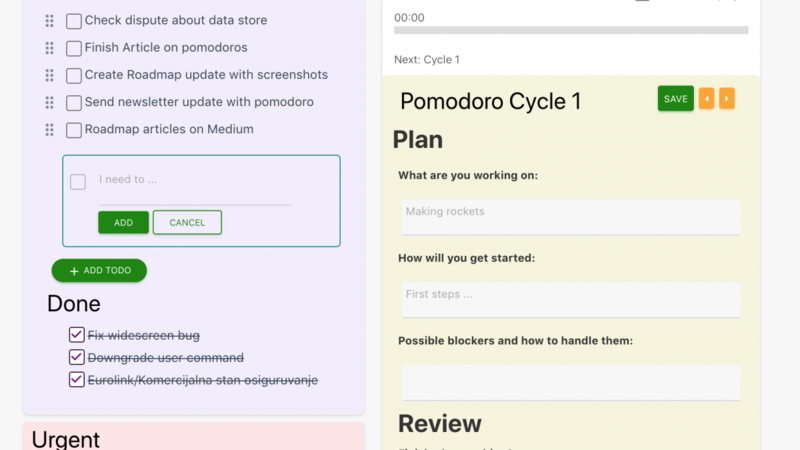 The exact number of Pomodoro cycles you entered will be generated here. Use the orange buttons to navigate between the cycles. For every Pomodoro cycle there are 3 questions to be answered before starting and 2 questions afterwards, they are all optional. The first 3 questions are used to keep you focused on the task at hand. What are you working on? 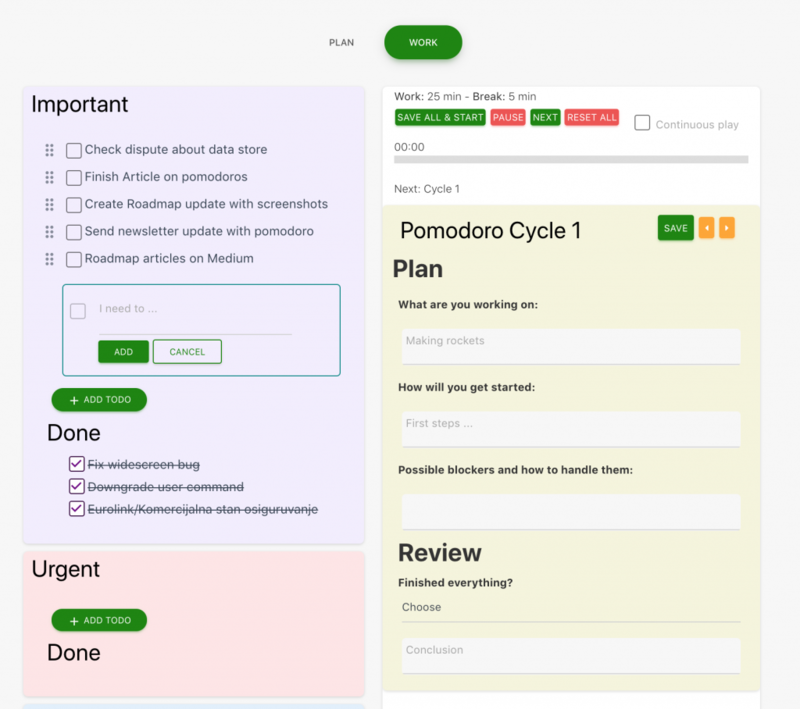 – Specify exactly what you are going to work on, choose one task per one cycle. This will keep you focused. How will you get started? – Define the first step towards completing your task. This will give you the initial momentum to get going quickly when the timer starts. Possible blockers – Try to anticipate any blockers that could come your way and plan your response in order to protect your time and to finish the task. Did you finish? – This is a select box where you can specify if you finished the chosen task. This will give you interesting statistics over time, when I create a work review module. 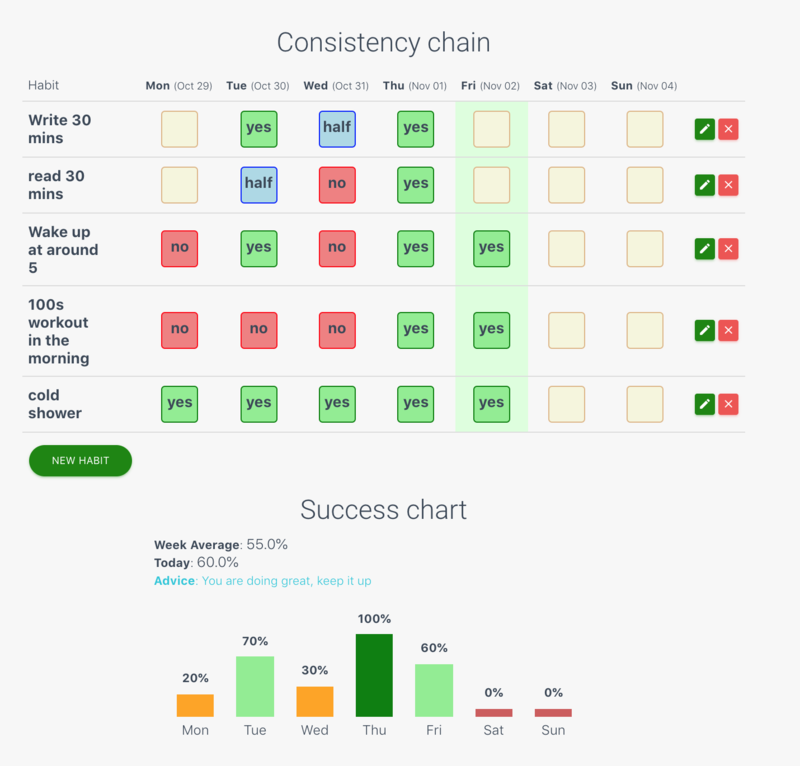 For example you could figure out which days and at what time are you most productive. Conclusion – Record if you made some mistakes planing or something unexpected happen or if you finished your task 10 minutes earlier. Reflect and become better at future planning. All of these questions are separate for every cycle. I answer only the first question for all cycles beforehand then fill out the rest as I go. When you are ready to start working, click the Save All & Start button. Afterwards this button will disappear because you already started. Pause/Resume – Pauses the work or break if it’s already running. Resumes if you’ve previously paused it. Next – Immediately starts the next cycle. For those moments when you finish early and don’t need a break. Reset All – Resets the timers and goes back to the first cycle. For those moments when you forgot you started the timer and got dragged into a meeting, or procrastination hijacked your brain. Save – Save your answers anytime you make changes to them after the cycle has started. By clicking this once you save all the questions from all cycles. You can choose to continue working on previous sessions as well. On the first screen there is a dropdown with all previous sessions you have created. They are named after the date and time of creation. The text editor I’m using called Summernote has been giving me some trouble so I will be experimenting with different ones. Let me know at darko@lifehqapp.com if you have experience with any other editor. Need to improve the responsiveness in general of the website, especially for smaller mobile screens. The Resources section for projects will have local file upload and/or import from Google drive. PS: I started reading this book Atomic Habits by James Clear, so expect to see some improvements to the LifeHQ Habits module. Wish you a productive year full of accomplishments.